Our 30th concert season ended duly with the last concert at Niederfellabrunn castle featuring the piano recital of Anna Volovitch (see concerts 2017). There will be some non-long-term planned special concerts in the future; our regular visitors will be informed by us. Since our stronghold for concerts in Vienna seems not to be available any more, there will be no Mahogany Series any more. 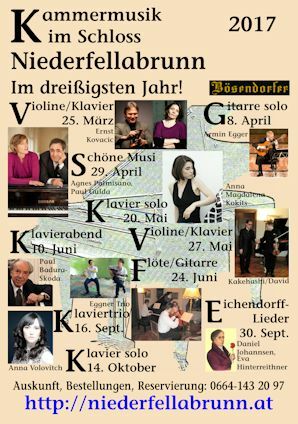 Recitals with fortepiano, however, will take place at Oberrohrbach Church (details in German only). No more folders from 2018 on! No more year-posters! Earlier folders can be downloaded here!